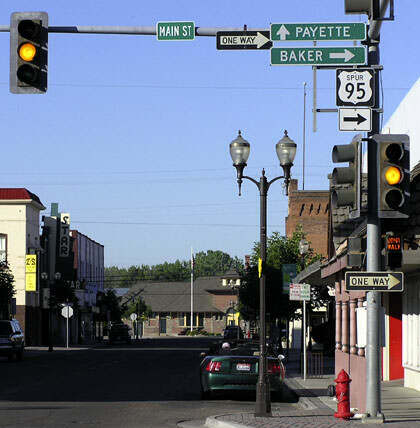 As of Jan. 2019, this page is no longer a public-facing part of the usends.com website, because we have determined that US 630 was probably never a signposted route. 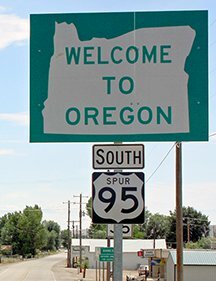 More info is available on this page, and some of the images below have been added to the US 95 page. This US 630 page is no longer maintained, and is kept only for archival purposes. 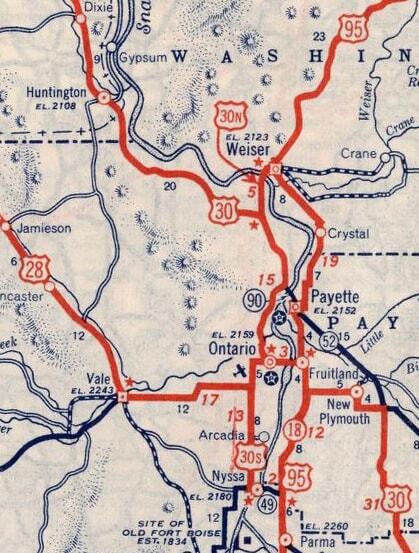 Note: this page also discusses the original south end of US 95. 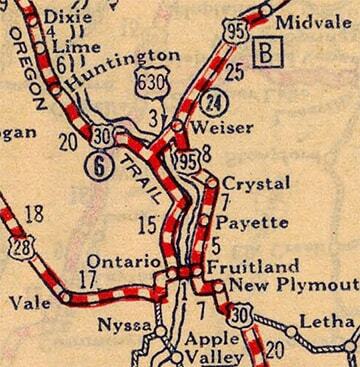 US 630 was the shortest mainline US route ever, weighing in at a whopping 3 miles. 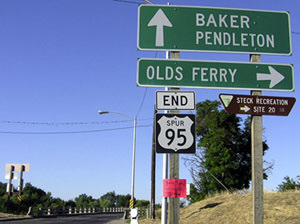 Its history also involves US 30 and US 95, and there is some question whether it was ever signposted, because old maps have conflicting info. 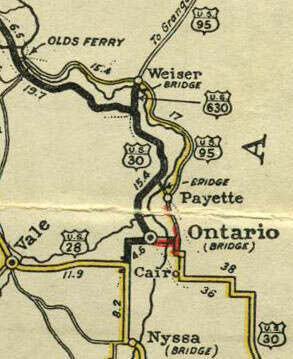 When the US routes were first commissioned in 1926, US 630 was not included on the list. 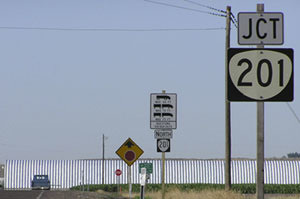 US 30 followed what is now Business 30 between Fruitland ID and Ontario OR, and then OR hwy. 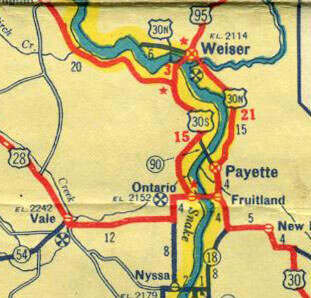 201 up to Weiser Jct. 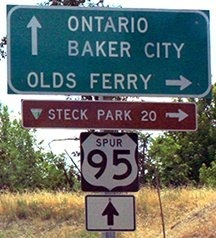 OR, and across to Farewell Bend. 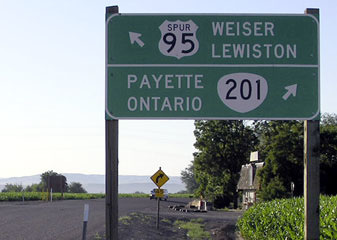 At that time, there was also a "US 30N" in the area: it departed US 30 at Fruitland and followed today's US 95 north through Payette to Weiser. 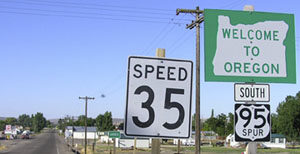 Routings through town have changed a bit over the years, but from Weiser it was essentially directed along what is now signed as "Spur US 95" across the river into Oregon, where it reconnected with US 30 at Weiser Jct. 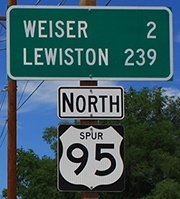 Originally the south beginning of US 95 was at its junction with US 30N in Weiser. 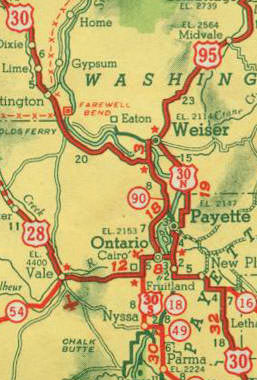 Apparently in 1927, US 630 was commissioned, in a move that may have been an attempt to get rid of the US 30N designation: some maps (such as the ones above) indicate that US 630 replaced US 30N from Weiser ID to Weiser Jct, and that US 95 was extended down to US 30 at Fruitland, replacing US 30N between there and Weiser. 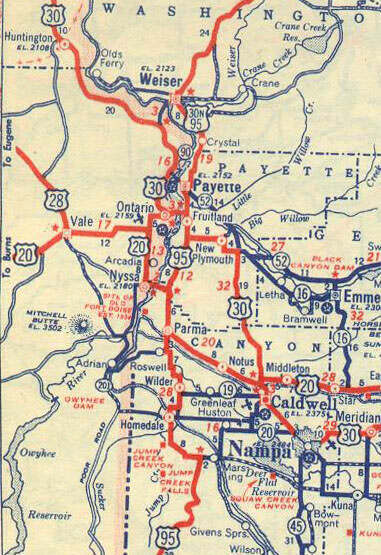 Other information suggests that US 30N was never decommissioned, but that US 630 and US 95 were co-signed with it. That was looking west on Main at State. 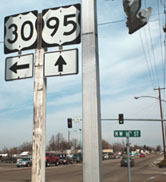 That used to be westbound US 30N (which continued either by turning left or going straight ahead). 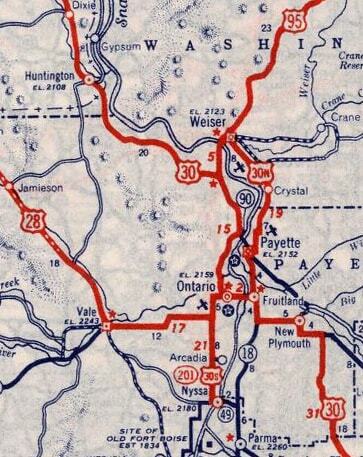 Also going one of those two directions was the north beginning of US 630. 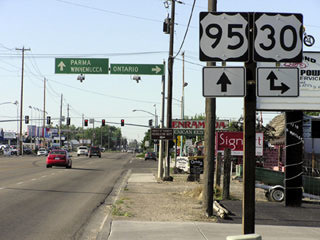 Northbound US 95 originally began to the right. 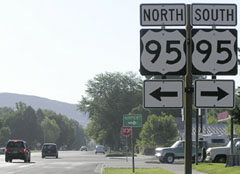 At the time, Spur 95 (the designation that now serves in place of both US 30N and US 630 south and west from here) was well-signed through Weiser. ​That was looking east on Main at 7th. 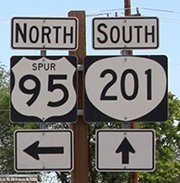 At various times, this was also eastbound US 30N and southbound US 95, both of which continued to the right. 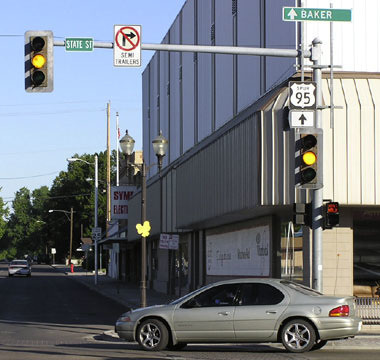 That was looking east on Main at 7th. 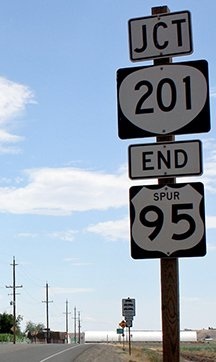 At various times, this was also eastbound US 30N and southbound US 95, both of which continued to the right. last updated Apr. 30, 2016.